Working remotely? Wondering how can you optimize relationships with coworkers and customers when you’re not in the same location or time zone? Remote workers must acknowledge and resolve a unique set of challenges to maximize their effectiveness in the remote workplace. In this seminar, you will learn how to best function in individual, team, and leader roles remotely. 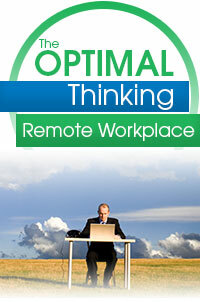 The Optimal Thinking Remote Workplace seminar is designed to help participants understand the specific issues associated with working remotely and to provide the most compelling, practical strategies to ensure optimal success as a remote team member. Each participant takes our complimentary self-assessment or 360-assessment beforehand so that you receive tailored insight to consistently achieve your best outcomes.